You can now build your own unique combination of satellites, using below free print-it-yourself paper cutout satellite models. Makes for a fun day of real hands-on rocket science and space engineering! So what do all these satellite parts do? Watch your favorite movies with your friends and explore the favorites of your friends! Some of the famous titles could be Star Trek, Star Wars, Apollo 13, Armageddon, Space Cowboys, the Astronaut Farmer, Interstellar, Gravity, The Martian, Contact, 2001 A Space Odyssey, Hitchhikers Guide to the Galaxy, The Guardians of the Galaxy, … and many more. An easy and fun way to get together, exchange views and ideas while proudly showing off your heroes! 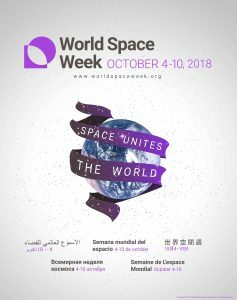 A World Space Week meeting could be as simple as finding a bar with an astronaut photo on the wall, the Moon on a mural in your favorite Street Cafe or meet for a picnic or walk under the sky! Ask your science center, museum of natural history, aerospace museum or any other technically oriented Centre for Education for a space talk or a guided tour through the space exhibit. Do you like quizzes and you are a big space fan? Why not organize a WSW themed pub quiz night? Get in touch with your favorite quiz organizers and team up with them to commemorate WSW with a fun, spacey quiz night. You can also organize such an evening with friends at your local school, high-school or university! A great idea would be to maybe even organize space themed prizes for your event! Are you member of a book club? Then reading and discussing for a sci-fi or space themed book, short story or parts of books are a great idea! Science – or is it fiction? Are you passionate about space and you know somebody with a science background? Have a sci-fi to science event by talking about science fiction and how close it is – or not – to becoming science. You could use a movie, book or TV-show as an starting point for a discussion. If you like good food, friends and space, you could bring all of them together by organising a space themed cook off! This event could be a cooking or baking party making “space” foods. You could make cake pops that look like planets, alien cookies (the ones that don’t turn out!) or experiment with molecular cooking to bring science into your home! For all of you out there that have not given up the dream yet – get together with friends and do some intensive training for your regular run meet-ups or power walks. Add a few leds to your cap, running shoes or train in your favorite space TV-show t-shirt! Discover how intriguing and motivation space can be by letting your creativity soar! Recreate, or create your own space paintings, spacecrafts or drawings! Take a creative or scientific photo that is space themed and then have a viewing party to see with your family and friends. Create your own hashtag for the contest and motivate your Instagram Followers to join in – this is a great idea to combine with the visits to your local museum or space exhibits, talks and other points mentioned here. A picture can sometimes tell a thousand stories! Wouldn’t it be great to have your own deep space discovery satellites hanging down the ceiling of your classroom or event venue? You can now build your own unique combination of satellites, using below free print-it-yourself paper cut-out satellite models. Makes for a fun day of real hands-on rocket science and space engineering! So what do all these satellite parts do? Invite rocket clubs to build and launch their own rockets during World Space Week. Make a contest by getting donors to provide prizes. Invite special guests or subject matter specialists to lecture on topics of interest about space Discoveries, what space does for us in every day life and other topics. Organize a conference, a summit, symposium or seminar during the week of October 4-10. Invite special guests to speak, invite delegates, organize special subject tracks, arrange a venue. A SpaceUP is a great way to bring space fans together. Any space facility, ground stations, development and industry locations to open the doors to the public. Open school days to have demonstrations and hands on science experiments for students. Have special guests visit the schools. Have industry experts go to schools and speak to students about their work in the space industry with demonstrations, experiments and real world applications of how science and math are necessary. Arrange a star party. Get some food and drink a telescope on a clear starry night and you are set! At the local planetariums have a party, lecture or event and ask the management to reduce rates or open up to the public for free that week.